It’s been a crazy year so far with new events like WebMavens, previous shows and private workshops, but the year is only half over. My speaking schedule for public events is now mostly finalized so I’m excited to share where I’ll be as well as discounts for some of the shows. The list below is in chronological order. Let me know if you’re attending and we can meet up. 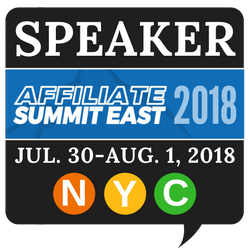 I wrote this post on why you should attend Affiliate Summit and there really isn’t much more to say other than I have been to over 20 and continue to go. I love the show, there’s awesome networking, some good sessions and lots of business to be done. My session at the show is a live site review with a focus on SEO and monetization. If you’d like us to review your site, make sure to get there early and submit it. Here’s my affiliate link if you’re buying a ticket. One of my favorite things to do speaking wise are local meetups, especially when the locals are people I look up to professionally. Local shows are personable, you can speak more freely and everyone gets to talk to, interact with and meet everyone else. I feel really fortunate that they’ve invited me down and am really looking forward to it. The best part of the local shows though is the price…you seriously can’t beat it. Click here to get your ticket. Its very rare that I get to speak in my own city, so be prepared for a ton of energy and fun. This is one of the best blogging shows I have ever been to. The bloggers are there to learn, network and grow their sites into a business. You’ll find sessions on legal issues, monetization and SEO as well as content creation, media kits and pretty much everything else related to blogging. If you’re a blogger or you work with bloggers, do not miss this show! Click here to buy your ticket. This is my third year being invited back (very thankful) and I cannot say enough about it. It started out as a regional show for the DFWSEM community and blossomed into a multi-day, multi-track show. You can go here to learn everything from link building to tech SEO audits, network with SEOs from agencies of all sizes to in house and search engine employees from Google, Bing, etc… If you’re in Dallas, do not miss this one. You can also use coupon code “AdamR100” to save $100 off your ticket. Pubcon is another show I do not recommend missing. The educational sessions here are always solid and you’re almost guaranteed to learn something new. Whether you’re into tech SEO, link building, penalty recovery, PPC, social media marketing or looking for a job, this is the big show to go. The big difference with this and one of the local shows is that it is a huge show. There are multiple tracks, it’s multiple days and you are going to meet a ton of people (i.e. there is always something going on that you can benefit from). Bring business cards, bring throat drops (so you can keep talking) and get ready to leave with a brain full of ideas and solutions that you can implement when you get home. That should be it for shows that are opened to the public. I have a couple of workshops I’m doing for companies, but those are private. If you’re at any of these conferences, make sure to leave a comment below or use the contact form in the top right or right hand side of this post and lets set up a time to meet. Looking forward to seeing you! Keep an eye out for that post! No problem. Hopefully you can make one of the shows. We’re super excited to have Adam headed to Australia in April 2018 to speak at Big Digital Adelaide 🙂 and we extended our Super Early Bird pricing ’til end of July so you can take advantage of a great low price.